💎 Furqan – the ability to differentiate between right and wrong, what is good and what is bad, what is beneficial and what is harmful. Scholars said that it also means a way out and aid in this Dunya and the Hereafter. 💎 The expiation of sins and His forgiveness – Scholars mentioned that they mean forgiveness for both small and big sins; or that they mean forgiveness for both one’s past sins and future sins. 💎 Tremendous rewards from Allah SWT. 1. Will be guided to differentiate between truth and falsehood. This will be a triumph, safety and a way out for them from the affairs of this life, all the while acquiring happiness in the Hereafter. 2. Will also gain Allah’s forgiveness, thus having their sins erased and pardon, thus having their sins covered from the people. 3. Will be directed to a way to gain Allah’s tremendous rewards. May Allah SWT make us one of the Muttaqun. Fear Allah and keep your duty to Him. Verily, Allah is All-Aware of what you do. Self-Evaluation and Taqwa must come together. This ayah is called Ayatul-Muhasabah by scholars of tafseer, because within it is a commandment for every one of us to evaluate ourselves. 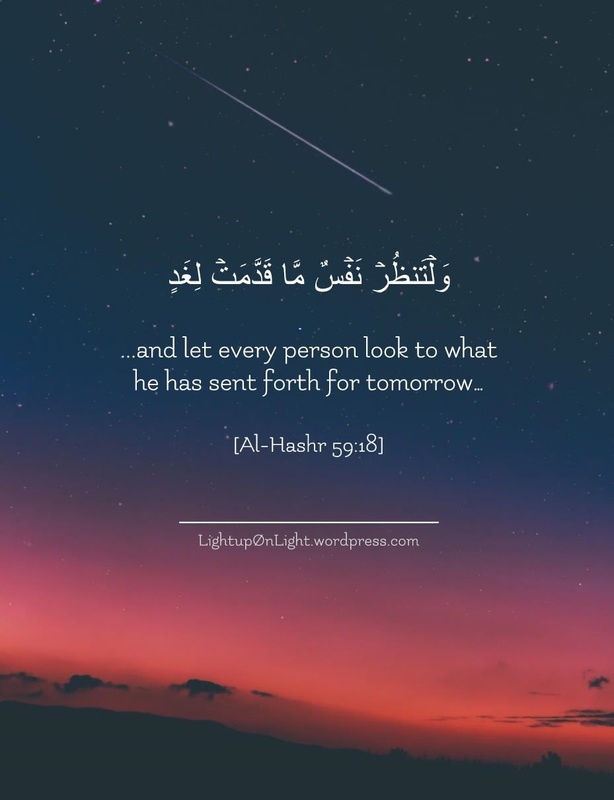 “…let every person look to what he has sent forth for tomorrow.” To what extent have we prepared for the meeting with our Creator? And notice that the commandment is sandwiched between two commandments to have taqwa of Allah, indicating that THE BEST form of self-evaluation is by having taqwa – how much have we obeyed what He SWT has ordered, and how much have we stayed away from what He SWT forbid? So it’s important to remember that the measuring stick when we do self-critique is in accordance to the Akhirah, not the Dunya, not the amount of praises we receive from people around us, nor the amount of likes and followers we gain on the social media. It’s super easy to be deluded by praises and number of ‘likes’. It’s super easy to forget our flaws when people attest our good qualities. Don’t be deluded by Fame and Praises. When we look at the example of the companions of Rasulallah ﷺ, we see that they had this immense level of humility – that even though Rasulallah ﷺ PRAISED and ATTESTED their good character in front of everyone in the community, even though he ﷺ said that Allah SWT has guaranteed Jannah for some of them – they still remained self-critical. They never stopped engaging in self-reflection. They never felt that they were completely safe from falling into hypocrisy, or safe from falling into sins. Subhanallah, look at Umar’s RA level of self-critique! The things that we don’t take ourselves to account are often the things that we are praised for. Umar’s RA strength, direct critiques, and generosity were all praiseworthy, he was praised by Rasulallah ﷺ himself, and by everyone else, yet he still called himself to account for those exact things that he was praised for. Subhanallah. He SWT is All-Aware of every single thing that you do. Meaning for all the good deeds that you do privately, for all the inner struggles and personal endeavours you have exerted in becoming a better person – even if nobody in this entire world will ever see or understand it – then know that Allah does, and He will reward you for it, so keep on going. If people praise us, telling us that we have certain good qualities that we know we have not yet acquired, we STILL should not be swayed or deluded from our actual pursuit to develop those qualities. And even if we do have those qualities, we should still keep on aspiring and asking Allah SWT for it, because the ceiling of having husnul khuluq (beautiful manners) is of Rasulallah ﷺ – and we’re not going to get there in our lifetime. The standard that we should set for ourselves is the one that was set for us by the Divine, not by people. We are on a one-way journey to our Creator. Remember that when we stand before our Rabb on the Day of Judgment, we are free from both praises and criticisms of people. We are free of our titles. We will stand before Allah SWT alone, and He knows who we truly are. When we stand in front of Him, it will all be laid bare. All of us must undergo an honest self-evaluation pertaining to our journey back to Allah. When we think about it, we’re really just made of number of days. And when an hour passes by, we lose our capital. We lose an hour from our asset. As the day passes, we’re one day closer to our destination – our death, and our standing before Allah. May Allah allow us to engage in a self-criticism that would purify us, and not one that would cause us to despair of His mercy. May Allah forgive us and protect us from hypocrisy, from arrogance and self-righteousness, but instill in us husnul khuluq. May Allah SWT make our private lives better than our public lives. May He SWT help us to become more pleasing in His sight than we are in the sight of the people. Allahumma ameen. [An-Nahl 16 : 99-100] Are We Weaker Than Shaytan’s Weak Tricks? over those who believe and put their trust only in their Rabb. over those who obey and follow him, and those who join partners with Him (Allah). “Verily, Allah promised you a promise of truth. And I too promised you, but I betrayed you. I had no authority over you except that I called you, so you responded to me. Kerana mereka yang dikuasai adalah LEBIH LEMAH. Because those who let themselves to be overpowered by the weak tricks of shaytan are even WEAKER than that. So it’s abhorrent to see someone, for example, feel proud because he is rebellious to his parents, or feel accomplished for being a nuisance to his community, or feel cool for speaking vulgarly to others. It’s ugly for the self to feel superior over others, because while we may outwardly look strong to everyone, we’re actually very weak for falling into the ploys of shaytan. Don’t allow ourselves to be delusional of this reality. Don’t allow shaytan define for you what ‘strength’ is. It is true that the nafs by its very nature is inclined towards freedom. However, religion restricts this ‘freedom’ in order to discipline the nafs. Without such restriction, we could lose all good values and the nafs might lose control and act in a completely irresponsible manner. The nafs is constantly being tempted since what is alluring is always attractive. A person may enjoy listening to and taking part in gossips, deriving a vicarious pleasure in it because s/he feels s/he is better than the person whose weaknesses are being exposed. Or the nafs may find committing adultery an enjoyable way of satisfying its desires. But if we really think, we’ll find that this short-lived ‘freedom’ is not worth the trouble, because we will have to bear the consequences of our misdeeds for a long time. If we think about all the sinful pleasures we might have enjoyed 10 years ago, and then ask whether we’re left with any of those pleasures now, what would be the answer? Nothing! The pleasures of sin have vanished, yet the punishment remains. But think of fasting in Ramadhan 10 years ago. What effects are we feeling now from the suffering of thirst? What is left of that hunger pangs 10 years ago? The pain and suffering undergone for the sake of performing duties lillah have disappeared, but the reward stays with us. You have been endowed by Allah SWT the power of reasoning and the will to choose which way is best. So will you not utilize them before it’s too late? The 9 Characteristics of ‘Ibad-ur Rahman (8/10) – Respond To The Ayat of Allah s.w.t. A Project in collaboration with The Ideal Muslimah. Articles authored for The Ideal Muslimah are available here. fall not deaf and blind thereat. 🌸 Eighth Characteristic: They Respond To The Ayat of Allah s.w.t. Alhamdulillah, today we will be discussing the eighth characteristic of ‘Ibad-ur Rahman. This next category could include you who are reading this right now! Before we proceed, let us think back: How many of us have read the Qur’an, or listened to heartfelt reminders regarding the Deen, or read something that is absolutely beneficial that we just gotta share with everyone – yet at the end of the day, we’re like: “Yeah it was a nice speech / post, but I’m still gonna do what I’m gonna do anyway.” So we close our computers, we return to our homes, and nothing changes. This attitude has got to change. Because Allah s.w.t. tells us that the ‘Ibad-ur Rahman are nothing like this. When they read, listen, or are reminded of the ayat of Allah, they do not pass or trip over the ayat like the deaf or the blind. They are not those who like to read and keep on reading, or listen and keep on listening, or share and keep on sharing, yet nothing of themselves have truly changed. The hearts of ‘Ibad-ur Rahman are attentive and moved by the ayat of Allah – its commandments, its prohibitions, its reminders, its stories – and their limbs carry out the good actions that they have learned. and they put their trust in their Rabb. As for those who believe, it has increased their Faith, and they rejoice. But as for those in whose hearts is a disease, it will add suspicion and doubt to their suspicion, disbelief and doubt, and they die while they are disbelievers. Indeed, how many have read the ayat of Allah, but they remain deaf and blind. How many have looked at the signs of Allah, yet they do not see. How many have heard, but they do not comprehend. These are certainly not the characteristics of ‘Ibad-ur Rahman. We all love attending Islamic seminars or classes, or watch Islamic youtube videos, or listen to Islamic podcasts, or read Islamic articles. But sadly, some have turned these khutbah, classes, seminars, posts – and even recitation of the Qur’an – as entertainment. They have been reduced to just becoming something fun to do or participate. We’re not guilty for enjoying them of course, but these reminders should be taken as something more serious – because the ayat of Allah is not about casual listening, it’s about taking decisive actions. When Qur’an enters our hearts, there must be significant changes within us. even if they haven’t memorized it. May this reminder motivate us to become the people of the Qur’an. The hearts of ‘Ibad-ur Rahman are attentive and moved by the ayat of Allah – its commandments, its prohibitions, its reminders, its stories – and their limbs carry out the good actions that they have learned. They listen to the ayat of Allah with khushoo’ and are determined to implement the commandments, prohibitions, and reminders that they learn in their everyday lives. “No, O daughter of As-Siddiq. – while they fear that their Rabb will not accept it from them. The true and praiseworthy fear is that which stops a person from the prohibitions of Allah. And another praiseworthy category of fear is to fear returning to the state of sinfulness and heedlessness after one has attained closeness to Allah. – The anticipation of punishment. – Allah’s lash with which He straightens up those who are fleeing from His door. – To do away with careless sense of security by envisioning the great news (of the Last Day). In essence, as what my teacher taught, [khawf] means a general fear, fear of something that is impending, eg. death, or the Day of Judgement. However [khashya] is fear with knowledge, a higher station of fear, for this fear never subsides within a believer’s heart who truly has knowledge. For example, two people are attending a funeral processing, during which both of them are humbly reminded of their deaths to come. One of them is fearful [khawf] of this impending event. He fears for that day. However, one month or two months later down the road, he forgets about it and returns to sins and transgressions. But the other person is a person of knowledge, he has [khashya] – fear with knowledge, he steers away from all types of sins because he WHOLEHEARTEDLY KNOWS that Allah is Ever-Watching, Ever-Hearing. His fear does not diminish. This is one of the reasons why – my dear sisters in faith, and my brothers in Islam – that the beautiful Names and Attributes of Allah s.w.t. is a critical branch of knowledge that every believer must try to learn. Only those who learn this knowledge will truly experience [khashya]. Subhanallah, it is a fundamental knowledge for any Muslim and extremely beneficial in all aspects of our lives, and more so for our Akhirah. May Allah grant us beneficial knowledge – Allahumma ameen. Ibn al-Qayyim rahimahullah wrote that when fear exceeds boundary, it may bring hopelessness and despair. This is why it is important for a believer to balance his fear with hope. The heart in its journey towards Allah s.w.t. is like a bird whose head is love, and hope and fear are its two wings. When the head and the two wings are sound and healthy – the flight of the bird is good; but when the head is cut off – it immediately dies; and when either or both wings are deficient – the bird cannot properly fly and may become victim of a trap. The righteous predecessors preferred to strengthen the wing of fear during good times when heedlessness is feared, and to strengthen the wing of hope at times of calamity and when near death. towards His Rabb’s [mercy] from his Rabb’s [displeasure]. “This Day, We (Allah) will forget you as you forgot the Meeting of this Day of yours. “Have I not given you a spouse, honored you, and subjected the camels and horses to you? Allah the Exalted will say, “Then this Day, I will forget you as you forgot Me. and the life of the world deceived you. nor shall they be returned to the worldly life (so that they repent to Allah). Therefore o sons of Adam, be wise! Do not let the pleasure of this world fool you, for there will come a definite Day when no apology shall be accepted by the Rabb of all worlds. There will come a definite Day when Allah s.w.t. will forget you, as you have chosen to forget Him.